A new French thesis on UFOs: the dissertation entitled “Le soucoupisme français: 1945-2012″ (French Saucerism: 1945-2012), by Thomas Margout, who obtained a doctorate in history at the University of Western Brittany in Brest (France), on December 8th, 2017. Just a year after that of Manuel Wiroth, this is the second university thesis on the history of the UFO movement in France. 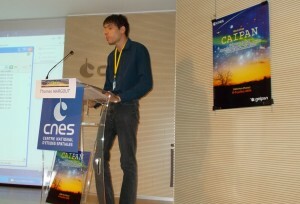 Margout is not unknown in the UFO environment, since for the writing of his thesis he had asked the help of our colleagues from the SCEAU (Sauvegarde et Conservation des Etudes et Archives Ufologiques) and had also attended GEIPAN scientific conference on UFO CAIPAN in July 2014, with a poster illustrating his work. So it was a surprise to read an interview he gave to daily newspaper “Le Télégramme de Brest” on 11 December 2017, in which he stated, among other things: “The overwhelming majority of ufologists are perfectly serious people, who saw a phenomenon that they cannot explain”, thus confusing ufologists and witnesses. From the text now available it has been possible to understand that the confusion between ufologists, witnesses, contactists and sect followers was not a mistake but a choice of his. In fact, Margout himself explains: “In most cases, these investigators were also witnesses, they are here in the role of gathering and collecting testimonies similar to theirs”. So an ufologist would simply be a witness who questions other witnesses, although the author is not giving any statistics that prove his statement. Some choices of data and interpretations by the author are indeed questionable, and that is worthy a more detailed review.